Give your craft projects, clothing, and even repairs that "special something" with X-Factor Duck Tapes from ShurTech! 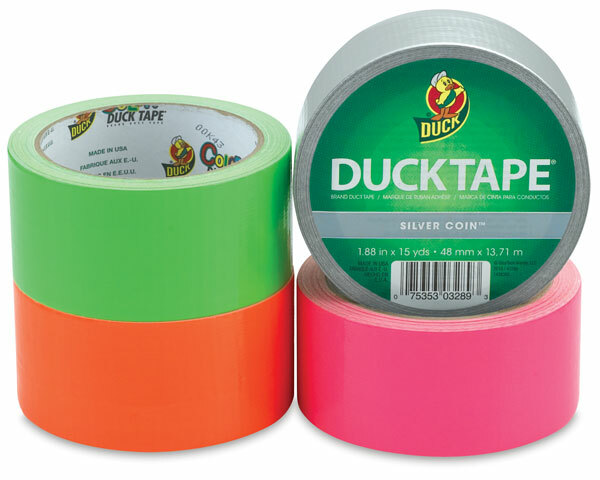 Building on the strength and adhesive qualities of the original Duck Tape, these colorful tapes are ideal for adding color, shine, strength, and style wherever it's needed. Use X-Factor Duck Tapes as a base material or for adding accents to craft projects, for color-coding boxes or other items — even for creating original fashions for proms, parties, or other events. Mix and match them with ShurTech Duck Tape Prints and Color Duck Tape for even more possibilities. Duck Tape X-Factor tears by hand without curling and it conforms easily to uneven surfaces. ® ShurTech is a registered trademark.® Duck Tape and X-Factor are registered trademarks. ™ Silver Coin, Island Lime, Blaze Orange, and Funky Flamingo are trademarks.